· Frequency response: DC100 kHz / + 0, -3 dB (when using SR - 007 × 1 unit). · Harmonic Distortion Ratio: 0.01% or Less / 1 kHz 100 V r.
(SR-007 × 1 Unit Used). Amplification: 54 dB (500 times). · Rated input level: 200 mV / 100 V r. · Maximum output voltage: 340 V r.
· Input impedance: 50 k (RCA), 100 k (XLR). · Input terminal: XLR × 1, RCA × 2 (parallel out terminal). · Bias voltage: 580 V DC. 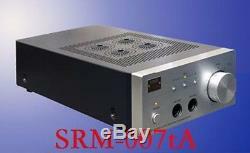 · Power supply voltage: AC 100 V, 50/60 Hz. · Vacuum tube to be used: 2 each 6 FQ 7/6 CG 7. · External dimensions: 195 (W) × 103 (H) × 420 (D) mm (excluding protrusions). The voltage for this electronic device is 100V and made for Japan usage ONLY. In order for you to use this device outside Japan where the voltage is higher than 100V such as 200V-240V, you are required to use a transformer to adjust the voltage to your local country. WIthout using a transformer, this device will be broken. We are not responsible for the damage of this device if you use it without a proper transformer. Please let me know if you have any questions. Also, please tell me if you have what you're looking for in Japan items. North America Central America Middle East AU, NZ. ASK (5 - 20 days). 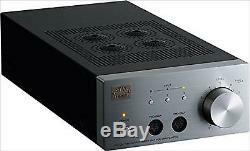 The item "STAX SRM-007tA vacuum tube driver unit EMS Speed Shipping from JAPAN" is in sale since Monday, March 13, 2017. This item is in the category "Consumer Electronics\TV, Video & Home Audio\Home Audio\Receivers & Amplifiers\Amplifiers & Preamps". The seller is "japanderful" and is located in Tokyo, setagaya.